As the weather takes a turn for the worse, there’s only one strategy for survival: beginning our reading period hibernation by stuffing our faces with Harvard Square treats. So to make winter’s approach just a little bit easier, we’ve compiled a list of our favorite guilty pleasures. After all, it’s basically the holiday season now…right? This hidden gem is an absolute must. The Signature Hot Chocolate comes in both milk and dark, and tastes like pure chocolate warmth. We’re seriously not kidding. The beverage is the smoothest, sweetest, and most delightfully rich drink ever. There’s even a Spicy Hot Chocolate on the menu if you want to switch it up for some extra punch. It’s not the cheapest hot chocolate you’ll ever have, but it’s divine enough to be worth it. If you’re like us and crave hot chocolate late at night, J.P. Licks has cute hot chocolate kits sold to-go for you to make in the comfort of your dorm — super helpful for those days when the trek across Mass Ave’s (toxic) slush just doesn’t seem bearable. With options beyond just ice cream, this convenient spot doesn’t have to be forgotten in the winter. They also serve yummy hot breakfasts, including savory croissants and oatmeal. Trust us, Tatte’s not just for law school kids or that Manhattanite friend who eats there every day. 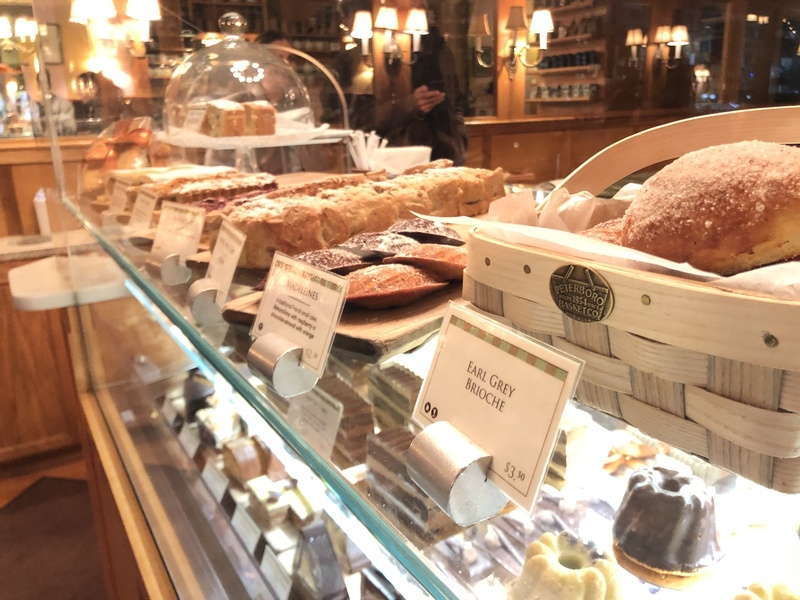 For $9.50 at Tatte you can order a pastry basket, fully stocked with two butter croissants, a chocolate croissant, a crisp apple muffin, a piece of sweet bread, and one fruity jam. Perfect to share (or to keep all to yourself, let’s be real), this special is a pastry lover’s dream. We know it’s getting cold (and wet), but when did that ever stop anyone from scarfing down a cannoli? Correct answer: never. Just across the street from the Smith Center, Mike’s is perfect for those late-night study sessions in the Collaborative Commons. They’ve even gotten into the festive spirit, with creative menu items like a pumpkin spice cannoli. Pro tip: the M&M pretzel sticks are a great source of quick energy when you’re on the go. Even though winter may be coming, you’re still a college student, and that means a trip to Insomnia every now and again is practically required. Close to the river Houses (and unfortunately for our diets, the Crimson building), this slice of cookie-filled paradise is — as we all know — open until 3 a.m. and perfect for any late-night cravings. Often hot from the oven, these cookies always taste better late at night. We’ve also heard it said that if you stop by near closing time, they toss in leftovers with your purchase...why not confirm this magical possibility for yourself? Tucked away next to Felipe’s, Crema has everything you could want for when the weather dips into the twenties: gooey ginger molasses cookies, oh-so-fall pumpkin apple chai muffins, and a cozy interior that will let you instantly forget the nor’easter outside (or your midterm). The zucchini cardamom muffin (hear us out on this one!) has the perfect little kick necessary to help you finish your last pset. Wanted to go to Europe this J-term but flights were just too expensive? Pretend you’re in Belgium by heading down Mass Ave to this cute waffle shop. Specializing in create-your-own waffles and fresh-brewed coffee, Zinneken’s is guaranteed to warm you up if the thought of an upcoming month-long break can’t. If you’ve got an especially big sweet tooth, run next-door to BerryLine while you’re at it. Because who really cares how cold it gets anyways? BerryLine is BerryLine, meaning it’s timeless. You can literally never go wrong here.